The wedding ring vows are what you say to each other as you exchange rings during the ceremony. If the exchange of vows has been rather lengthy, this part can be very short. If not, this part can contain longer wording that can either be repeated after the minister or answered as “I do.” The repeating after the officiant is the more common way, but don’t worry. The marriage celebrant will always say the words slowly and in short bunches because she knows that the couple is nervous standing up before a crowd of family and friends. The blanks are to be filled in with the names of the bride and groom. The vows which have been exchanged by ______ and _____ have been offered in our hearing. But words are fleeting, and the sound of them is soon gone. Therefore, the wedding ring becomes an enduring symbol of the promises which have been made. The ring, which is circular and un-ending, is also a reminder of the never-ending love of God for each and every one of us. May these wedding rings be for ______ and ________ a reminder of the vows they have shared today and a witness to all the world of their commitment in marriage. Repeat after me as you put the ring on each finger: Bride/Groom, as this ring encircles your finger from this day forward, year in, year out, so will my love ever encircle you. Wear this ring as a symbol of this love. Do you have symbols of your love and these vows to give to each other? (Give to Officiant.) Let these rings say to all that your commitment is deep and everlasting. As you wear your wedding rings, may infinite love be nurtured through all your years to come. Place this ring on ______’s finger and repeat after me: With this ring, I thee wed. Or alternatively: This is my beloved and my friend. You have chosen to exchange rings as a sign of your love and commitment to each other. The wedding ring is a fit symbol of the unbroken partnership of marriage, which should continue until broken by death. Let them be constant reminders to you of your obligations to each other and mute incentives to their fulfillment. You are to wear these rings as an enclosing bond of reverence and trust. You both are to fulfill the perfect circle of duty that makes you one. By these symbols of covenant-promise, Gracious God, remind _________ and ___________ of your encircling love and unending faithfulness that in all their life together they may know joy and peace in one another. With this ring – I give myself to you – to be your husband/wife. – I promise to love and sustain you – in the covenant of marriage – for as long as we both shall live. These rings are a symbol of the truth of the vows you have spoken. These rings represent the eternal love of God that lives in you and in the love that you share. What symbol do you bring signifying your mutual commitment? These rings are of God: so may your love for each other be the most precious possessions of your lives. 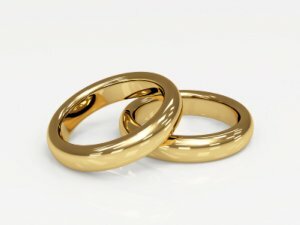 These rings also constitute a circle; may they symbolize the never-ending loyalty and honor that shall encompass your marriage. I, ___________, take you as my wife/husband. I pledge to share my life with you, to speak the truth to you in love; I promise to honor and care for you, to cherish and encourage your fulfillment, to love and respect you through all the changes of our lives. GROOM: In token of my love and devotion, I place this ring on your finger. BRIDE: In token of my love and devotion, I place this ring on your finger. Go from "Wedding Ring Vows" to "Home Page"
Go from "Wedding Ring Vows" to "Wedding Vows"